Win 2 Tickets to the RHS Hampton Court Flower Show + a Family Meal Out! I'll bet that everyone has heard of the acclaimed chef Raymond Blanc and his amazing dishes. His son Oliver Blanc has created a wonderful children's app called 'Henri le Worm' which is all about teaching kids where their food comes from in a fun and engaging way through games and storytelling. It's definitely something that I will be introducing to C as he loves to learn. This year, Oliver has a children's garden at RHS Hampton Court Flower Show in Surrey and I've teamed up with French restaurant group Brasserie Blanc to offer one lucky reader the chance to win two tickets to RHS Hampton Court Flower Show (30th June to 5th July and a fabulous meal for the family at their local brasserie. Amble through the beautiful gardens at the Hampton Court Flower Show and while you are there visit the Henri le Worm children's garden, also available as an interactive app, where Raymond Blanc's son Olivier has set up a marvellous edible shed and livestock area for kids to enjoy! Then once you've worked up a hearty appetite, visit any Brasserie Blanc restaurant of your choice for an indulgent meal with French favourites such as slow-cooked duck leg confit; roast pork belly with sauté potatoes; and pan-fried hake fillet in a white wine, clam and samphire broth to name but a few. The menu is complemented by a selection of irresistible desserts and well-crafted wine list. 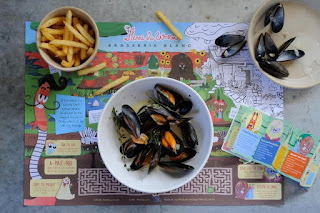 Pint-sized tots also have their own Henri le Worm menu with delights in half portion sizes such as charcuterie platters, mini moules pots, crispy chicken and lip-smacking puddings. Before entering, due to the time limit on these tickets, please be sure that you will be able to attend the show on Friday 3rd July and that there is a Brasserie Blanc in your location or one that you can travel to as a family (see locations here). This giveaway will run from 20th-26th June so get your entries in quickly! The prize for a complimentary meal must be taken by 1 December 2015. Not available on any bank holidays. The prize is non-transferrable and has no cash value. Subject to availability. 2 comments on "Win 2 Tickets to the RHS Hampton Court Flower Show + a Family Meal Out!"